The Progress-Focused Approach: How willing are we to talk to people with different views? How willing are we to talk to people with different views? To what extent are you willing to talk to people who think very differently about topics such as politics and religion? Your attitude toward a topic is determined by what you think is true, in other words: by your beliefs. To what extent can people change their attitudes about topics? People with a fixed mindset believe that attitudes generally do not change. People with a growth mindset believe that attitudes can change. Petrocelli, et al. 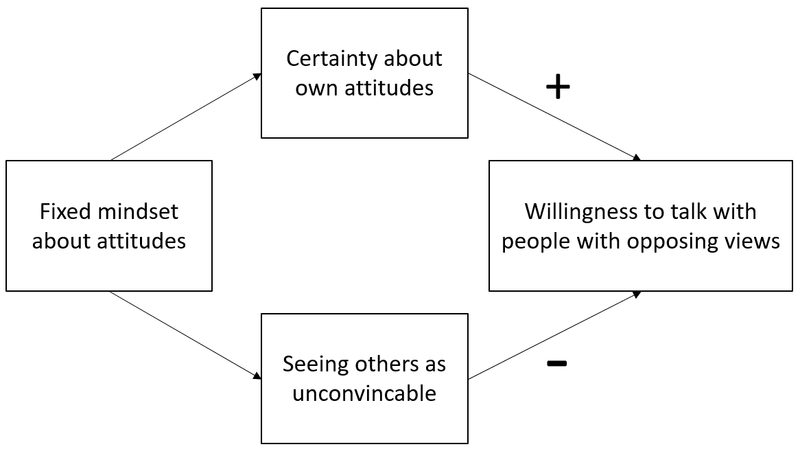 (2010) demonstrated that people with a fixed mindset tend to be more certain about their attitudes. Other research showed that people who are more certain about their attitudes are more inclined to express their views (see Visser, et al., 2003). Akhtar & Wheeler (2016), on the other hand, argued that people with a fixed mindset might be less inclined to express their views in the face of people with opposing views because of their belief that other people will probably not change their beliefs, anyway. Akhtar & Wheeler did five studies in which they found that in people with fixed mindsets about attitudes these two effects happen concurrently and these effects cancel each other out. On the one hand, they want to express their views, due to their certainty about these views. On the other hand they don't want to engage in a conversation with people with different views because they don't expect these people to change their minds, anyway. Next, Akhtar & Wheeler asked respondents to focus on the goal for expressing their views. They asked one group to focus on the thought that expressing your views is a way of standing up for your views. The other group, they asked to focus on the thought that expressing your views can be a way to exchange views and influence other people. Only the first group of respondents were more willing to express their views. Our willingness to talk to people with other views thus depends on how we think about the malleability of our beliefs and attitudes and on the goal of the conversation. If we believe that people can change their beliefs (growth mindset) they will be more willing to engage in a conversation. If they think people generally do not change their beliefs (a fixed mindset) they will not be inclined to talk to people with different beliefs, unless they view this as a way of standing up for their beliefs. A growth mindset about attitudes and beliefs seems to me a more effective and realistic way of thinking. I think that people can change their attitudes, also about important and sensitive topics. Naturally, not every context lends itself for conversations with other people with opposing beliefs. But a principal unwillingness, regardless of the circumstances, seems unwise. The fixed mindset confirms itself. If we do not talk to people with different beliefs, we miss out on an opportunity to exchange ideas. We deny ourselves and the other person new information and views due to which a change in attitudes, indeed, will become unlikely. That is no way to make progress.